It was a battle of the Whitaker brothers this afternoon in Monaco, with Michael reigning supreme in today’s CSI5* Trophée Casino de Monte-Carlo class, finishing just tenths of a second ahead of brother John. In an edge of the seat jump-off, Michael Whitaker (GBR) piloted his grey horse Valmy de la Lande to the top of the leaderboard, snatching the win from the hands of John Whitaker (GBR) who looked on phenomenal form with top stallion Argento - the horse making his return to CSI5* level this weekend. Speaking about his brother John, Michael said: “He’s been beating me all his life, but it’s nice to get one back! My horse is unbelievable careful, he’s a fighter - he’s got a little bit more experience to come but I’m excited about him." The biggest class on the second day of the Longines Global Champions Tour of Monaco saw temperatures rise in the perfect prelude to Saturday’s showdown. 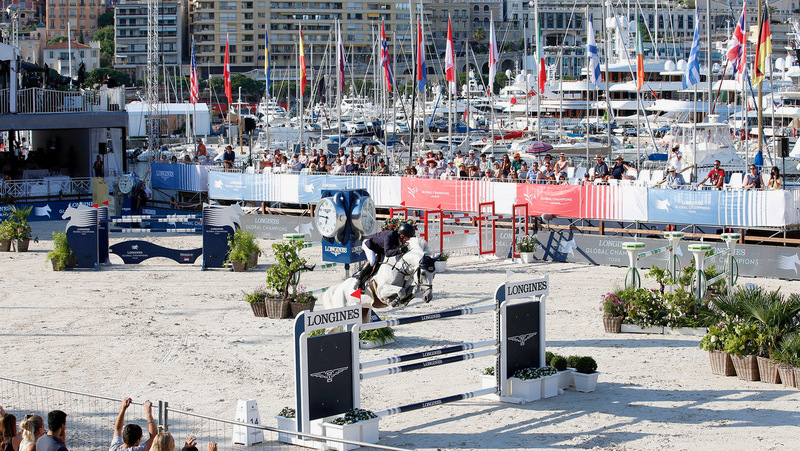 The incredible show jumping arena, sandwiched between Monaco’s famous yacht harbour and the Prince’s Palace, attracted a stylish crowd enjoying the lifestyle of the Principality and world class sport. The LGCT of Monaco once again received tremendous support from HSH Prince Albert II of Monaco and Princess Caroline of Hanover and her daughter Charlotte Casiraghi who attended during the three-day event. Fans and tourists lapped up the amazing scenes as superstar horses performed metres from the seafront and VIPs arrived on private tenders from their superyachts to enjoy first class hospitality on the French Riviera. During the three-day event Bill and Melinda Gates and Her Excellency Sheikha Al Mayassa bint Hamad bin Khalifa Al Thani, sister of the Emir of Qatar, were among guests appreciating the wonderful destination for top equestrian sport. Frank Rothenberger put together a technical, tough track for the world’s top international riders, utilising the full width and breadth of the arena. A light Sapinda vertical and a wide Massimo Dutti oxer required plenty of focus, responsiveness and bravery, with plenty of the best athletes in the sport falling short of a clear today. Bertram Allen (IRL) put in a brilliant round with the popular grey Hector van d’Abdijhoeve, a hot pick for the win. However John Whitaker (GBR) and top stallion Argento, who returns to CSI5* competition for the first time this year, look to be on phenomenal form, jumping clear and adding their name to the formidable jump-off list. World Number 1 Harrie Smolders (NED) put in an impressive round with relatively new mount Corrada, adding his name to the jump-off but the pair perhaps untested in a flat out race against the clock. Joining him would be Gerco Schröder (NED) with Glock's Zaranza, Michael Whitaker (GBR) with Valmy de la Lande, Leopold van Asten (NED) with VDL Groep Urane de Talma, Michael Duffy (IRL) with Egalini, Marlon Zanotelli (BRA) with Sirene de la Motte, and Julien Epaillard (FRA) who was fastest of all with Safari D Auge. First to go Marlon Zanotelli (BRA) carved the path for the rest to come, proving how tough today’s jump-off course was. A total of seven faults with Sirene de la Motte, and there would be plenty for the others to play for, despite the extremely tight time allowed. Flying Frenchman Julien Epaillard (FRA) revved the engines of Safari D Auge, powering out of the starting blocks and taking every chance. The turn back to the double was brave, and they looked set to be the trail blazers as they galloped to the last, but the final fence fell, despite their finish time of 32.15s. There was disappointment for Bertram Allen (IRL) with Hector van d’Abdijhoeve, as they flew from the top to the bottom of the arena, picking up 16 faults in the testing course. Faults kept coming, with Gerco Schröder (NED) with Glock's Zaranza, Emanuele Gaudiano (ITA) with Chalou, and Leopold van Asten (NED) with VDL Groep Urane de Talma all collecting penalties. The time allowed was incredibly tight, as shown by John Whitaker (GBR) with Argento who picked up 1 penalty but jumped cleanly to propel themselves in the lead in 36.41s. His brother Michael Whitaker (GBR) put in a smooth round with Valmy de la Lande, making up time at the penultimate fence by finding a long stride to finish just a touch faster in 36.04s but also picking up a time fault. World Number 1 Harrie Smolders (NED) pulled out a smooth round with Corrada, up on the time and looking strong to take the win. But their was heartbreak as the final fence fell, with Smolders stopping the clock in 35.93s, just inside the time allowed. So the win would go to Michael Whitaker (GBR) with Valmy de la Lande, finishing ahead of John Whitaker (GBR) with Argento, with Michael Duffy (IRL) with Egalini rounding out third. Saturday welcomes the final day of competition at the Longines Global Champions Tour of Monaco, with the GCL Monaco kicking off at 16:45 and the coveted LGCT Grand Prix du Prince de Monaco presented by Sapinda, taking place at 20:15. Tune in live via GC TV to watch all the action LIVE. For more information about LGCT Monaco, please click here.